He came, he saw, and he pocketed all the deals that matter. Chinese President Xi Jinping’s tour of Southwest Asia – Saudi Arabia, Iran and Egypt – could easily be sold anywhere as your typical Chinese-style win-win. On the PR arena, Xi did a sterling job polishing China’s image as a global power. Beijing scored diplomatically on all counts, obtaining several more layers of energy security (over half of China’s oil come from the Persian Gulf) while expanding its export markets and trade relations overall. In Iran, Xi oversaw the signing of 17 politico-economic agreements alongside Iran’s President Hassan Rouhani. Yet another diplomatic coup: Xi was the second leader of a UN Security Council member country to visit Tehran after the nuclear deal struck in Vienna last summer; the first was President Putin, in November. Note the crucial Russia-China-Iran interaction. To make it absolutely clear, Xi issued a statement just before arriving in Tehran, confirming Beijing's support for Iran to join the Shanghai Cooperation Organization (SCO). That will solidify for good the key strategic partnership trio working for future Eurasia integration. Of course, this whole process revolves around One Belt, One Road – the official Chinese denomination of the larger-than-life New Silk Road vision. No other nucleus, apart from Russia-China, offers so much potential in terms of bilateral cooperation; Iran, as much as during the ancient Silk Road uniting imperial China and imperial Persia, is the ultimate hub uniting Asia with Europe. Xi’s high-tech caravan stopped first in Saudi Arabia and Egypt – the Arab world. Xi’s message could not be more crystal-clear: «Instead of looking for a proxy in the Middle East, we promote peace talks; instead of seeking any sphere of influence, we call on all parties to join the circle of friends for the Belt and Road initiative». As Xi was still in Arab land, Beijing officially issued an «Arab policy paper»; a first, tracing the history of China-Arab world interaction from the ancient Silk Road up to the founding of the Sino-Arab State Cooperation Forum in 2004. And even before addressing the – fractured – Arab League in Cairo, Xi emphasized it once again; what matters for China is «win-win» cooperation all around. Translation: business, business, business. And no Chinese interference in fractured Middle East politics. Xi’s diplomatic offensive, a spin-off of One Belt, One Road, seeks no less than reconfigure the Non-Aligned Movement (NAM) – for which China is a global champion – in the context of emerging new financial architecture, centered on the globalization of the yuan. That includes the push for the yuan to become one of the world’s reserve currencies; and mechanisms such as the Asian Infrastructure Investment Bank (AIIB) and the Silk Road Fund, much more attuned to the needs of the developing world than the IMF, the World Bank and even the Asian Development Bank (ADB). A win-win for China as far as the Arab Middle East is concerned implies the pricing of key commodities in yuan – a long-term but essentially inevitable development. And Beijing is eyeing not only Saudi Arabia but the whole GCC (Gulf Cooperation Council) – which happens to be a de facto financial centre for Africa, where China has a massive presence, with Eastern Africa on top of it being linked to the Maritime Silk Road. Post-sanctions Iran, already in overdrive, is all about (re)integration into large swathes of the global economy. Yet China was already in Iran even before the lifting of sanctions. Iran wants to increase its petrochemical output, by 2025, to 180 million tons. Chinese investment will be key. According to a recent report by global energy, metals, and mining research and consultancy Scottish group Wood Mackenzie, Iran may attract as much as $70 billion for its petrochemical projects. On the alternative energy front, Iran has the capacity to generate 40,000 megawatts (MW) of electricity from solar and wind resources. Chinese companies will definitely be on it. As an NPT member state, Iran will continue to use nuclear energy for peaceful purposes. Chinese companies are already a player in the redesigning of the Arak heavy water reactor, and will be involved in producing isotopes for medical purposes and desalinating seawater. Investment in mining is also a certainty. According to the World Mining Congress (WMC), China and Iran were the 1st and 10th largest minerals producers in the world in 2013. Iran holds more than 7% of the world’s proven mineral reserves, but only 20% of these have been developed. Foreigners are now allowed to operate Iranian mines for 25 years – and China will be on it. One Belt, One Road is mostly about high-speed rail. So no wonder upgrading and expanding Iran’s railway network is a key plank in the Joint Statement on Comprehensive Strategic Partnership between Iran and China. Of course progress along the New Silk Road(s) will face numerous pitfalls. No one yet knows the full details about the Iran-China strategic partnership; Tehran won’t be content with being just a transit route for China’s exports; it aims at being a key trans-Eurasian partner. China is a WTO member; Iran is not a full member yet. China is at the center of multiple trade agreements while Iran is a partner in only a few. Cooperation with the Central Asian «stans» may be quite a feat – as some, like Uzbekistan, are quite jealous of their economic practices. 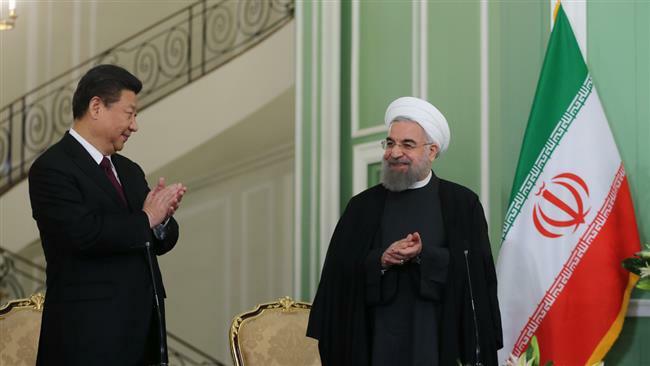 And a multi-vector, complex relationship between Tehran and Ankara is still a work in progress; Turkey after all physically connects Asia to Europe. 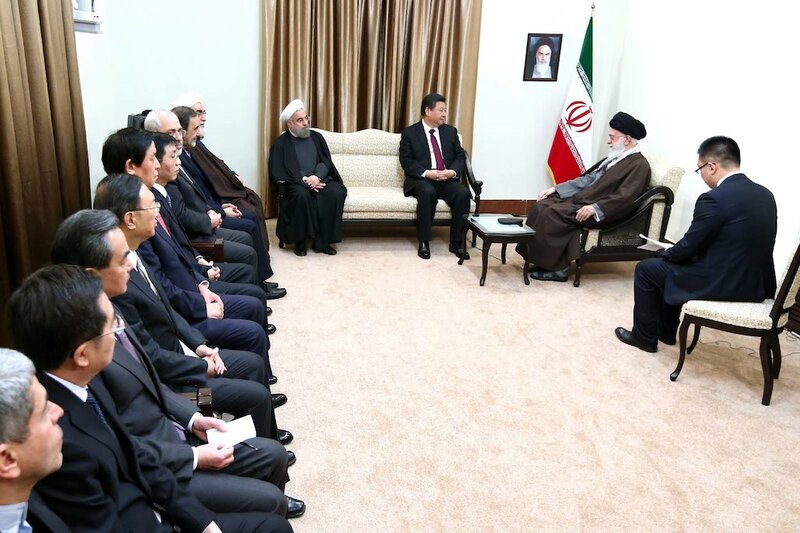 Geopolitically, Iran’s Supreme Leader Ayatollah Khamenei unambiguously set the tone as he met Xi. China, said the Supreme Leader, is a «trustworthy» country; the establishment of a «25-year strategic relation is completely correct and wise»; and last but not least, «…The Islamic Republic of Iran will never forget China’s cooperation during the time of sanctions». Subtle but firm, Ayatollah Khamenei could not but refer to the stark difference between Iran and Saudi Arabia in the absolutely crucial – for China – area of energy security: «Iran is the only independent country in the region that can be trusted in the area of energy because unlike many regional countries, the energy policy of Iran is not influenced by any non-Iranian factor». The bottom line is that for Beijing, a strategic partnership with Iran is a matter of vital national security. Moreover, geostrategically, Beijing sees Iran as an essential hub, in Southwest Asia and Eurasia for that matter, counterpunching Washington’s much-advertised «pivot» and US naval hegemony. That implies Beijing’s full support for a powerful Iran in the arc spanning the Persian Gulf to the Caspian; all these maritime and land routes – New Silk Road-wise – are vitally important to China. There is no fulfillment of the New Silk Road vision without a comprehensive Iran-China strategic partnership. Xi and the Beijing leadership not only solidified it; in a sweeping move, they sort of upgraded what some Iranian analysts define as Khamenei’s «defensive realism» theory of international relations to a de facto protection ring of China’s geostrategic interests. A master class. And it’s all going according to (Beijing’s) plan. Next step is Iran as a full SCO member. Eurasian integration, here we come.